Engineer: Larry Alexander; Recorded at The Warehouse, Philadelphia. 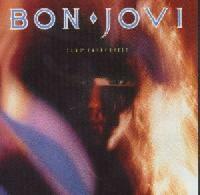 Album Notes: Bon Jovi: Jon Bon Jovi (vocals, guitar), Richie Sambora (electric & acoustic guitar, background vocals), David Bryan (keyboards, background vocals), Alec John Such (bass, background vocals) and Tico Torres (drums, percussion, background vocals). Additional personnel: Rick Valenti, Jeaanie Brooks, Carol Brooks, Phil Hoffer (background vocals), Randy Cantor (programming), Jim Salamone (programming) and Tom Mandel (synthesizers). Additional engineers: Obie O'Brien, Mal, Bill Scheniman. What do we have here? Still the same super powers.. It's the coolest cd ever! its 7800 F... but is it hot? 7800 Degrees of pure rock and roll!!! An improvement from the 1st album!